Below is the axis setup for the elbow joint manipulator. I am trying to workout the DH parameters for the manipulator. Green frame represents the base and frame1. Starting from there, I am able to get the correct values up to joint3 (purple frame). If I rotate the frame about Z, so the blue frame moves, it gives me incorrect values. Below is the DH parameter table. My question is, is the DH table setup correctly? If I move the frame about q3 I am getting invalid results. You will have to set q2 to -90 to achieve the configuration in picture. 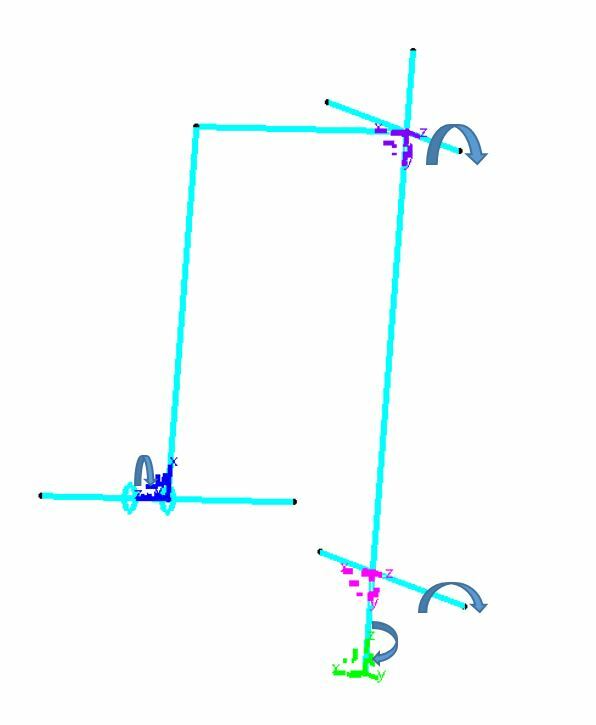 You can simplify the robot configuration by connecting the Purple frame to the Blue frame with a link. The length of the new link can be easily calculated with the Pythagorean theorem. Now you can obtain the DH parameters more easily. This setup will reach the same results as the original setup, but it is easier to obtain the DH parameters in this case. Not the answer you're looking for? Browse other questions tagged dh-parameters or ask your own question.